CARSON — The City of Carson will hold a swearing-in ceremony and reception on Wednesday, March 27, at 6 p.m. at the Congresswoman Juanita Millender-McDonald Community Center, 3 Civic Plaza Dr., Carson. The third item represents a victory for the Helen’s Dream Coalition, which was formed to urge the council to name the chambers after former City Clerk Helen Kawagoe while she is alive. 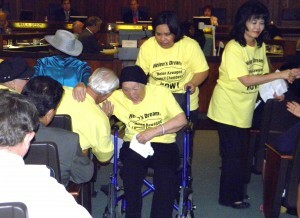 Kawagoe was serving her 10th term when she suffered a stroke in September 2011, and she now lives at South Bay Keiro in Gardena. Three of the five council members — Lula Davis-Holmes, Julie Ruiz-Raber and Mike Gipson — insisted that city policy prohibited naming the chambers after Kawagoe until after she dies. Dear and Councilmember Elito Santarina were in the minority seeking immediate action. Davis-Holmes lost in her bid to unseat Dear in the election, but remains on the council. Gipson was re-elected, but Ruiz-Raber finished in third place behind challenger Albert Robles, a supporter of the coalition. For more information on the coalition, visit www.helensdream.org. For more information on the City of Carson, including videos of past council meetings, visit http://carson.ca.us/.